If the opportunity has come to change your kitchen then this is something which you should give plenty of time and consideration to. After all, the kitchen is widely known as the heart of the home, the place where family gathers together and, if you love your cooking, the place where your masterpieces come to life. If your budget is tight, then it doesn’t mean that the pound signs have to start clocking up in your head either. When you’re thinking about how to choose your perfect kitchen, the secret is to think less about splashing the cash and more about having a good eye for design and ensuring that the kitchen itself is a good fit. Not only should it look good in your home, but it should also be well made and well fitted, which is where choosing the right fitter is the first thing that you should bear in mind. So, make sure you check out references, get recommendations from friends and have a good look around before you buy into something. Remember that your kitchen has to be right for you as the person who will be the one using it hopefully for years to come. If you’re looking for true style in your perfect kitchen, then a good idea is to stick with a simple design. There are some incredibly stunning and absolutely beautiful kitchens around at the moment, but which one is right for you? Have a good think about what sort of features, look and feel you want and have liked in kitchens that you’ve seen before. Stick with a theme, one which fits with your home and don’t mix and match your designs. Also, avoid having different shapes and sizes of units or a kitchen that is cluttered and looks crammed in. In keeping your design simple, you will create a space that is more visually pleasing, so think of symmetry in all that you try to achieve. For added space you could look to have glass fronts on your cupboard that will give the impression of depth and light and remember your kitchen goods can be concealed to add to the simplicity and uncluttered effect. There’s also the option of going with a more functional theme with your cupboards by making them flip up, pocket or corner style which should make things easier. There’s no point spending a lot on the things which will never be seen. Instead look to make the most of the things that will, such as kitchen taps, cabinet doors and of course your worktops. The worktop is where you can really go to town as this is one of the most visible features of your kitchen. There’s so much choice too, with options which include the low maintenance and neutral effect of granite, luxurious quality of marble, practical, sleek and tough composite worktop or the hardwearing surfaces of Corian and stainless steel. 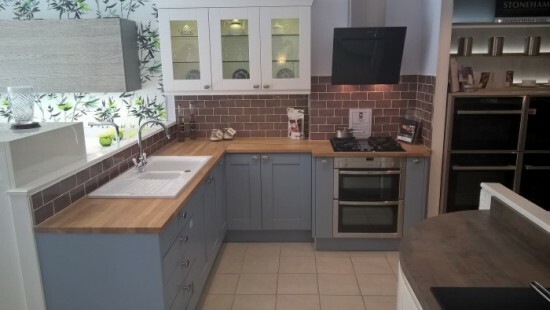 We have a wide range of kitchen shapes and styles in our Leicester showroom – all of them guaranteed to help turn your home into the comfortable or stylish haven that you’re looking for. Give us a call today or use our contact form to book a consultation or discuss the design for your perfect kitchen and we will see where we can help you achieve your dream.